Which team did you play in the last game? People of Forenia! All of you fought a long time for peace. Twenty five years after the New Government and the High Command, untold generations since Moskurgs and Arstotzkans began fighting. Innumerable lives lost, for the great country of United Forenia we live in today. Now, after only three short years of peace, everything we have made is threatened again. The foul pirate-nation of Cannala has shamelessly attacked our shores, for no better reason than their own greed, their own lust for wealth and power! Will you give up the freedom and prosperity which all of us, our ancestors, worked so hard for? No! Launch every ship, load every rifle, fuel every tank and plane! We must go to war! Here, you will join the nation of United Forenia to represent the Bay 12 Forums in a war against Cannala, played by the Spacebattles Forums! However, your job is not to fight or command, but to design weapons of war! Many of you participated in the previous Arms Race game, where there was a war between the nations of Arstotzka and Moskurg for the continent of Forenia. Ultimately, Arstotzka came close to victory, but peace negotiations revealed that the High Command of both sides were shamelessly exploiting their people. After a brief and violent rebellion, United Forenia was born, and now you will be playing as them. During the same time, there was another war between the nations of Cannala and the Juraki Shogunate over the far-away island of Turbados. Cannala won this war and conquered Turbados but it wasn't enough- now their greed has led them to attack Forenia without so much as a declaration of war. For this crime, we must destroy them, and we shall not stop until our flag flies over their capitol! It is January, 1938, during the heat of summer in the southern hemisphere. Your task is to design weapons which will crush the Cannalans. The Forenian Embassy is a thread on these forums, open to players from both sides. The Cannalan Embassy is a thread on the enemy forums, open to players from both sides. The Arms Race Discord is an optional place where you can communicate through both text and voice, in channels open to both sides and a private channel for your faction. The game is played in turns, which are broken up into phases. During each turn you will design new technology, revise it, and assign your armies. Each turn represents one season, or three months, and there are four turns each year: Starting in Summer, then progressing to Autumn, Winter, and Spring. The Design Phase is your biggest phase, where you design a new technology. Simply write a proposal, or vote on an existing one- you only get one design each phase. Remember to BOLD your votes for easy counting. The design with the most votes will be attempted. Then you will see the results of your design, based on a die roll and a difficulty which I assign (see difficulty, below). The Revision Phase is your opportunity to fix problems or make changes to your existing designs. This works like the design phase, but the changes you can make are smaller (see difficulty, below). You can also attempt to reverse-engineer enemy designs, if you have gained ground in a theatre where the design which you want to reverse-engineer was fought. The Strategy Phase is new: Unlike in previous games where your army fights on all fronts, you now only fight on two, but you get to choose which. (See map, below). The Battle Phase is when you wait to see your Battle Report. I will write a summary of the fighting which demonstrates how effective your new technology is, and your armies will gain or lose ground. Once the battle report is posted, the turn is over and the next one begins. Once you understand these basics, you can skim some of the other, more detailed rules. Most pieces of equipment have a resource cost, expressed in Ore and Oil. For examples see starting equipment, below. Ore represents the total amount of mining effort which an item costs, and oil represents its use of chemicals. If something is big, or uses rare metals, it will have a high ore cost. If something burns a lot of fuel, or uses very high-grade fuel, or uses exotic chemicals then it will have a high oil cost. Costs represent what is needed to supply a company's worth of men, or about 100 men. This means, that prices given might be for 100 rifles, 50 motorcycles with sidecars, or 5-10 tanks or planes, or even a single ship. Your nation has limited resources: The continent you start on provides 3 Ore, and 2 Oil, and plentiful wood. This is also listed in your Equipment section in each battle report. You can gain resources by taking certain sections of the map, and then holding them for one turn without losing ground. The map section, below, describes the resources available. If a design costs resources which you don't have, it becomes expensive, and can't be issued to everybody. The total amount of resources a design costs more than you have is called the Resource Deficit. A design with no resource deficit is Cheap, this means it can be issued to every soldier, or as often as your generals decide is tactically sensible. A resource deficit of up to 2 makes a design Expensive, meaning it can only be issued to officers, or 1 in 10 men. A resource deficit of 3-5 makes a design Very Expensive, available to only about 1 in 100 men. A resource deficit of 6-9 makes a design a National Effort, you can only field one at a time- so this is only worthwhile if it's something like an enormous battleship, a nuke, or mecha-godzilla. A resource deficit of 10 or more is Theoretical, and cannot actually be built. Some technologies Complex, being new and difficult to manufacture, and designs featuring them become one level more expensive. Consider expenses when planning your designs! Also, if you lose access to resources, any designs which become more expensive will immediately see the effects- equipment which doesn't have enough fuel and spare parts will need to be decommissioned. There are also special resources. 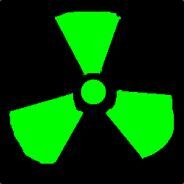 In the last game, each side captured some Aluminum and Manganese, and you still have access to these. Using them in your design adds ore cost, which is partly negated by holding the resource. On the new map (below) there are resources of Aluminum and Titanium, which can help you use even more aluminum or to use titanium, respectively. The last thing about resources to remember is that you have a limited Transport Capacity (see Starting Equipment, below) which determines how much resources you are capable of claiming from other territories you control. Your TC is given from the single vehicle which gives the highest TC in each mode of transportation (land, sea and air). Your homeland's resources do not consume transport capacity. The map is divided up into regions, which are further divided up into sections. Your control of a region might be written like: [Plains: Forenia 3/4, Cannala 1/4], assuming the "plains" region has four sections. Your army may only advance along the lines shown between regions on the map. During the battle phase, you will advance along two of these lines, and if you win in these regions, you will gain a section, or two if you are doing extremely well. Many regions have resources, and you will only gain those resources once you have held all sections in a region, and kept them for one turn. You will also be attacked in two regions, and the enemy may gain ground- but if you beat them in any area where you did not choose to attack, you will not gain ground. Conversely, if they beat you in an area they are only defending, you will lose no ground. The Cannalan Capitol has been moved to the west coast, and the Forenian Capitol lies to the east of their island. When either team reaches the enemy's mainland, they will fight through an entire region (4 sections) before reaching the capitol. A single victory at the capitol will end the game. As you can see, Cannala lies on the west side of the map, and Forenia lies on the east of the map. Islands to the west of Cannala and east of Forenia are inhabited by NPC's. 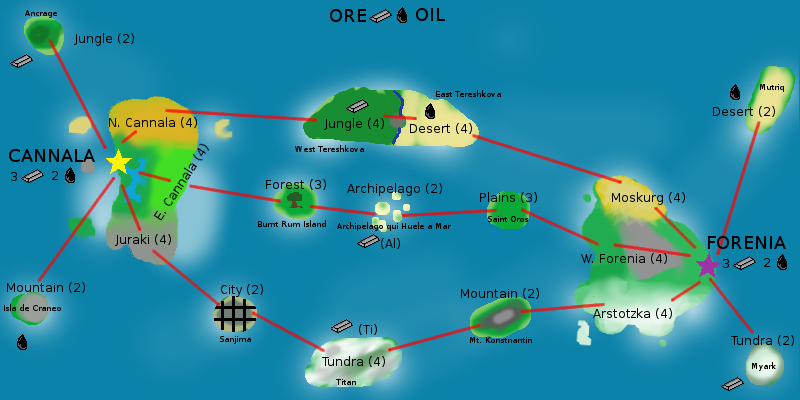 In the middle, Forenia holds the Plains island, and the Mountain island, and the Desert half of the north island- but you will only be able to exploit its oil starting next turn, and you will have to hold it. The Archipelago, and the Tundra, are both contested, with you holding half of the sections in each. Team Bonuses: You will choose one of these! Tereshkova: A veteran pilot from the bad old days of the terrifying AS-A19, he will focus his expertise on training the Forenian Air Force to fly expertly and with nerves of steel, to be superior in all air combat. Sidorenko: An expert Arstotzkan sniper, he will teach young Forenian soldiers the patience to watch, wait, and carefully consider every shot, even as the enemy fires back. Under him Forenians will outperform their foes in long range combat like the Arstotzkan army of old, as well as in indirect fire. Achmed: A Moskurg code-breaker, he will focus on the growing field of communications technology, and teach the Forenian army the value of of using encryption, breaking encryption, and effective radio coordination. Forenian soldiers will make better use of all communications and radio equipment. The following rules apply to armored land vehicles, with thickness for reference being Rolled Homogenous Armor, steel armor standard throughout WWII. 6) Super Heavy, 150-200 mm. Only historical example I can find is the Maus tank and ironclad ships. 7) Extreme, 200+ mm, or composite equivalent. 8 ) Composite only, we might never get this high in this game. Materials give a bonus to that value. Cheap, mild steel is -1, RHA is 0. Aluminum is -1 but lighter, Titanium is lighter with no such penalty, and alloys like manganese steel, composites or more exotic armors may be +1 or higher with various effects on the weight and cost. Good spacing and angling can give a further bonus (which might be wholly or partially negated by APBC rounds or an opponent's good marksmanship). When building armor, you can specify the thickness and material of the armor in different areas, as well as attempt to research new materials and techniques. Thicker armor also presents an engineering challenge in general; making thick armor is a technology on its own. Keep in mind that 0 armor is still armor and can stop stuff like 9mm pistol rounds, or small shell fragments. Landing Strips for aircraft are either Long, or Short. Small aircraft can use a short airstrip, while larger ones, such as bombers, may require a long airstrip. In this game, most landmasses will offer a long air strip, while a few locations as well as aircraft carriers will only offer short landing strips. Sea planes can also land at harbors you control. Unless aircraft are explicitly capable of long-range travel, they normally need to land a refuel at each region they pass through. Depending on the circumstances, having a landing strip close to the region in which combat is occurring may grant a bonus to air combat, especially in the case of aircraft carriers. The fights which take place on the sea don't represent a distinct territory; only land is gained and lost. However, each turn the effects of your naval efforts are calculated and can change your performance on land. Depending on how well you perform, one of the following traits is assigned: If your naval strength is Equal to the enemy, nobody has an advantage. If you are doing noticeably better, you have an Advantage, and have the benefit of outnumbering the enemy when fighting for islands. If you are doing better than the enemy in multiple aspects, you will have a Large Advantage, which confers the previous benefit as well as reducing enemy transport capacity at sea by half, rounded up. Naval advantage can also determine whether you have opportunities to use tactics like shore bombardment effectively, provided you are equipped to do so at all. The following difficulties apply to both Designs and Revisions, (henceforth just "Designs" for brevity) but revisions will usually be about one step more difficult than designs in addition to being limited in scope. For example, making a whole new design for a simple rifle in a new caliber would probably be Trivial, but Easy as a revision. Simple revisions are still perfectly capable of being trivial. Difficulty is mainly judged by three factors: What the best similar example of a technology you have built is, how long ago you built it, and what progress the outside world has made in that area. It's usually easy to make incrementally better designs, and the longer your factories build something, the better your engineering bureau grows to understand it. Real world countries serve as a frame of reference for what is cutting edge technology, it is very hard to get ahead from them, but it is also assumed your engineers might be able to spend some of their time learning from books, academic papers, photos, films and lectures available to the general public- although their reading comprehension is not to be relied on. Lastly, it is important to make a distinction from advances in engineering and advances in military doctrine: For example, assault rifles depend on using smaller caliber bullets than normal rifles so they can be controlled under automatic fire, and it took real life countries a long time to realize this. However, in the last game, you were able to make them far ahead of time because they are not actually difficult to manufacture. In addition to having "bugs" as a result of a poor die roll, some designs will simply have inherent drawbacks. For example, if you build a bomber with no top-facing guns, it will always be vulnerable to attack from above, or if you specify a tank design with lots of armor, a big gun, and a small engine, no die result is going to cause it to go fast. The consequence of bugs also depends on the nature of the design, a radio with severe bugs might just stop working and be hard to fix, but an aircraft with severe bugs will probably result in dead pilots. If a design makes simple advances in multiple areas, a poor result might only advance in some of those areas, where other areas suffer bugs or do not advance. Keep in mind that, as with all things in this game, design results are subject to a lot of, well, subjectivity. These are merely guidelines which I follow. A trivial-difficulty design would be one that pushes no new ground in terms of technology or engineering. If something is likely to be trivial, it should be done during a revision so as not to use up a design phase. An example might be adding an existing cannon design to an existing ship design which previously used a different kind of cannon. While revisions involving new technology are harder than designs involving new technology, revisions involving combining existing technology are often trivial. 1: On a roll of 1, there might or might not be a minor bug, depending on whether I can think of a bug that makes sense. If I can't think of a good one, the design succeeds as planned. 2-6: The design succeeds as planned. An easy design would be one that makes only a very small step in technology and requires some new engineering effort, such as making a new tank with thicker armor or a bigger gun or engine than previous tanks, but without any particularly new ideas involved, or a rifle designed to fire faster or be more accurate than its predecessors. It might also be several trivial changes in one design. 1: The design suffers some kind of bug, how severe it is depends on what sort of bug I can think of that makes sense. For example, perhaps a tank's ammunition is stored in a vulnerable spot or the new cannon jams often. Or the whole thing is just a bit rubbish. 2: The design probably suffers some kind of bug, but probably not too severe, or it just isn't as effective as you hoped. 3-4: The design succeeds as planned. 5-6: The design might accomplish something better than planned. For example, the geometry of a tank's armor might make it more effective than normal for its thickness, or a rifle might be extremely reliable even when caked in mud. A normal design advances your technology one "step" in a certain area, making it noticeably better. For example, you might build a cannon which fires shells about 50% larger than your existing ones, a machine gun which uses a new more effective type of action, your biggest ship yet, and so on. This is often the difficulty of a revision to remove a bug in an existing design. 1: The design suffers a pretty severe bug and the main advancement in technology probably isn't accomplished. 2: The design suffers a bug but the advancement in technology might be effective, or it works without any notable problems except that it isn't remarkably effective. 3: The design succeeds. It might suffer a minor bug, but it won't be crippling and probably won't affect future uses of the new technology. 6: The design might accomplish something better than planned. As with bugs, this depends on whether I can think of a way this makes sense. A hard design advances your technology by a couple "steps", such as building a new cannon more than twice as large as your previous largest one, or advances technology in multiple areas, such as building a tank with a new type of armor and new cannon and better engine than your previous one, or begins into a new field of technology but one which you would reasonably have access to, like your very first shaped charge explosive or radio system. A hard design might also be a design which was deemed Very hard or Impossible and failed before, but your team learned from the experience. Getting a technology advancement in a revision is usually Hard. 1: The design suffers multiple serious bugs or a bug which is difficult to fix, and the design is not very useful until these are corrected. It might not advance the technology as planned. 2: The design suffers a severe bug or multiple less serious ones. It might not advance the technology as planned. 3: The design suffers a noticeable bug, which future designs using this technology might have to deal with, or works in principle but isn't very effective. 4: The design succeeds. If it's a new type of technology altogether, it might suffer a minor bug. 5-6: On a roll of 5, or 6, the design succeeds. A very hard design is something which world powers struggled with for years to get right, like radar or jet engines. It represents the very cutting edge of technology. You should expect to fail the first time you attempt something like this, but it can be worthwhile nonetheless. A revision which attempts to make a leap forward in technology might be Very Hard. 1: The design fails to yield a useable example. Your designers simply couldn't get anything produced in time. 2: The design suffers a serious bug or bugs which make it nearly useless. For example, a rocket explodes on the launch pad. 3: The design suffers severe bugs which might prevent it from being very useful, but a working example is produced. At this level of success or higher, attempting another similar design might be Hard rather than Very Hard. 4: The design suffers moderate to severe bugs. 5: The design succeeds, maybe with a minor to moderate bug. A design with the "impossible" difficulty stretches credulity, or is out of your depth. If any real life countries attempted your design, they didn't succeed until a later time period if at all, and the engineering complexity involved is staggering. Alternatively, your design takes a flexible view towards the laws of physics. If you attempt an Impossible design, you risk wasting your turn. Examples might include a tank which is much bigger than your previously largest tank, but also uses less resources. Other examples would include being the first country to put a satellite into orbit well ahead of Sputnik, creating a working powered exoskeleton, or building effective laser weapons. 1-4: The design fails, probably with nothing to show for it. You might gain some small understanding of the technology with which you were attempting to pervert nature or flaunt physics. 5: You don't build a working example of your design, but your understanding in this field grows like succeeding on a normal design. 6: Depending on just out-there your design is, you make a significant breakthrough which will later allow you to attempt it again at Very Hard difficulty, or get a severely buggy working example. Depending on how badly you ignored the laws of physics, your working example might or not look like what you actually intended: For example, you might make a laser powerful enough to use as a weapon, but it requires a power source the size of a semi truck trailer. From time to time, you will be given Credits as a reward for various tasks. For example, you might produce propaganda to attract tourists and make money, earning an expense credit. Or, you might do a favor for the British, and in turn they share their research, giving you Research Assistance. Each of these is spent only once. Expense Credit: Makes one designer cheaper by one expense level, for one turn only. Espionage Credit: Allows you to undergo one act of subterfuge, such as sabotaging an enemy design, or stealing enemy plans. More creative tactics are also an option. Research Assistance: Allows you to roll 2 dice on a design or revision, and take the best result. Design/Revision Credit: Grants an extra design or revision outright. Might not be used in this game. After running two games like this already, I'm aware that they're prone to attracting bad attitudes. You should be warned that I've seen it all before, and I have very little patience for arguments which stall the game. Many of you have also played before, I expect you to understand by now that keeping the game smooth, on schedule, and argument free is probably a greater concern of mine than whatever you are arguing about: I expect you to be mature and adopt the same attitude. 1. Don't be salty! If at any time you find yourself having an urge to mouth off at another player, step away from the keyboard, go outside, and take a breath. Seriously. Players who repeatedly get angry or passive aggressive will be asked to leave. If you have an issue with the way the game is being run, DO NOT expect a tantrum to get you what you want. 2. 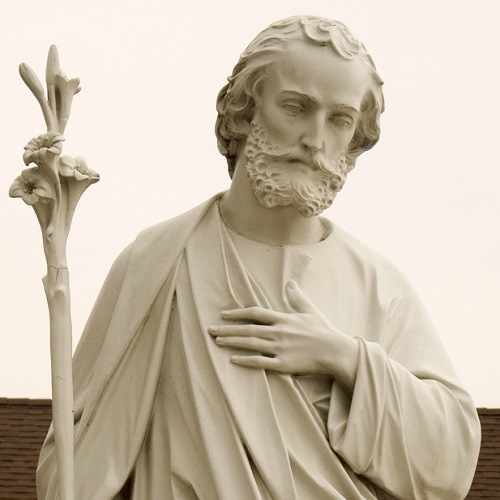 Keep in mind that I am not a historian, so there will sometimes be mistakes and inaccuracies. Even in the best of circumstances, minor inconsistencies are a common occurrence. If some piece of equipment is imbalanced/unrealistic, I might consider changing it if you bring it up once -AND ONLY ONCE- and politely state your argument. However, I will err on the side of consistency with my own game, I do not like to go back and change things. Sometimes it is more important to simply keep the game running smoothly than other concerns. 3. Do not accuse me of being biased. Do not accuse me of being biased. I have been told that I am biased towards the Arstotzkans, biased towards the Moskurgs, biased towards the Juraki, and biased towards the Cannalans. I have been told that I am bending the rules to make the game last longer, I have been told that I am bending the rules to end the game quicker. On multiple occasions this has nearly derailed the game. I have absolutely no more patience for this, and if you do it YOU WILL BE BANNED. 4. Do not spy on the other team's private thread, or try to get into their private discord channel. Trust me, playing fair is more fun for everyone! -AS-SP30: [L] [L]General infantry sidearm. An Arstotzka-made semi-automatic pistol, firing 9mm. It has a 10-round magazine and can fire quickly with moderate accuracy, at short range. Moderate stopping power. It is pretty reliable, and has a threaded barrel and can be fitted with a suppressor. -AS-AR34: [L] [L]The AR34 is an assault rifle chambered in new 7.62L ammunition, an intermediate powered cartridge. It is fed at the bottom from a wide 24-round magazine, or a 40-round drum, and ejects cartridges to the right side. It has a tactical rail an adjustable iron sights on top. It is select-fire, with a sliding knob for either single-shot or automatic. The knob is very stiff and requires soldiers to take their left hand off the weapon and force it. It has aluminum furniture, and a vertical pistol grip and foregrip. It weighs under 6kg. It has good stopping power and accuracy out to medium range, and is relatively easy for users to control even on automatic fire. It's about as long as the AS-F14, which means it is usable in close quarters but not ideal. Costs 2 ore (1 Al). -Sawed-off Shotgun: [L] [L]General infantry sidearm. Fires twice before breech loading, very effective at short range, ineffective otherwise. Poor armor penetration. Uses 12 gauge shells. -Cascade Sub-Machine Gun: [L] [L]This is a sub-machine gun, firing the .35 cal short pistol round. It uses a reliable closed-bolt blowback system. The bolt system is large, leaving room for an 8 inch barrel with a slotted hand guard. The stock is wooden, ugly, and stops at the receiver, where brass is ejected from the bottom of the gun. The short barrel gives poor accuracy, especially when hot, and the .35 cal short bullets have short range. The system fires about 400 rounds per minute. -M3 Sorraia GPMG: [L] [L] A .30 caliber machine gun fed from a belt. 50-round belts can be strung together for extended fire or stored in a belt box attached to the Sorraia, which for practical purposes is similar to a magazine. It uses a recoil action, and is configured to fire around 800 rounds per minute, achieved with the help of a muzzle booster (which looks like a flared end on the barrel). Weighs 22 pounds. Comes with a bipod, or tripod for emplacements. It uses copper heat sinks, which are now shrouded. It has a changeable barrel, which is necessary for emplacement use. It is effective to about 800 yards when mounted. Costs 2 ore.
-AS-F14A: [L] [L]A 7.62mm, semi-automatic rifle. It is an open bolt blowback action, and uses a 12-round box magazine with a small charge handle on the side. It has adjustable iron sights. The weight of the moving action makes the gun difficult to control, but this is mitigated by a heavy barrel. The blowback action is fairly reliable despite being open bolt. Also available as a carbine. -M2 Osprey: [L] The Osprey is a bolt-action rifle, chambered in 7.62mm, intended for snipers and marksmen. It is bolt-action, and has a 10 round magazine. It has a wooden stock, and the magazine protrudes a few inches beneath the rifle. It features a heavy barrel, and with its bolt action mechanism, has excellent grouping at long range. On top of the gun is a set of adjustable iron sights with a fine crosshair, and a rail for a telescopic sight. -Eagle Sight MkII: [L] [Expensive] A refractive telescopic sight designed with the Osprey rifle in mind. It is available in two types with variable magnification from 4x to 7x (long-range type), or from 1.5x to 4x (short-range type). Has a large objective lens which creates a bright picture, but short eye relief and a narrow field of view. They are [Complex], and they must be custom fitted to weapons which do not have rails. -Scimitar: [L] [Expensive] Officer sidearm. Elite soldiers receive a scimitar, a deadly curved sword which can be used on foot or horseback. Even in 1938, an officer's uniform is incomplete without his sword. 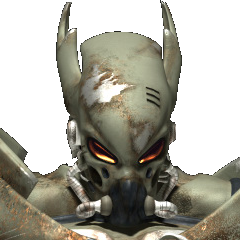 -Incinerator Flamethrower: [L] A heavy weapon, consists of two tanks on a soldier's back (one of harmless nitrogen as a propellant, and one of flamethrower fuel) and a nozzle with a pilot light. Shoots a jet of burning liquid about 25 feet. Includes an emergency cutoff valve. Costs 2 ore, 2 oil. -AS-1911 8cm Mortar: [L] A light mortar tube with rocket-propelled explosive shells, which fire after being dropped into the tube and striking the bottom. -AS-RPG28 A: [L] A rocket-propelled grenade, fired out of a launch tube. The grenade itself consists of a conical shape with a narrow tube of propellent out the back, and twisted fins in the middle of the tube. The launch tube is 3cm wide, a meter long and the rocket fits in up to the fins, and is just a metal tube with a handle. To ignite the propellant, soldiers remove a pin, on the rocket, which is first clipped by a short chain to a trigger on the handle. The tube itself and each grenade each weigh 3kg. It is accurate enough to hit a tank out to almost 100 meters, after which it drops quickly. Rockets are available with warheads based on each type of grenade, including a HEAT conical shaped charge. Requires 2 ore, 1 oil. -AS-G27: [L] The basic AS-G27 grenade is an oblong ball that fits comfortably in the hand, with a four second fuze started by pulling a ring. The casing breaks into fragments when it explodes. The AS-G27I is incendiary, the AS-G27S deploys smoke. The AS-G27AT is a cylinder shaped, magnetic shaped charge for tanks. A soldier can penetrate medium armor with it, but they have to run right up to a tank to stick one on. Costs 2 oil. -AS-LM20: [L] A landmine! Consists of an explosive, metal shell and button. Armed by removing a key. The mines are cheap and simple, and reliably kill or dismember infantry who step on them. -M34 Viper Landmine: [L] A multipurpose landmine, but mainly used for tanks. It's a disc shaped box full of explosives, with a trigger on top. The mines are specially designed to be stacked, their triggers ignite eachother simultaneously. The trigger is locked with a removable pin. The mines weigh 2.5 kilos each. Two or three are effective against vehicles, but a bit taller and heavier than a single mine would be with the same explosive content. Be extremely careful when stacking the mines! Costs 2 oil. -AS-1912 Artillery A [L]: A field gun firing 80mm shells, loaded through a sliding bolt. The action is not dissimilar to a bolt action rifle, where the old casing is ejected when the bolt is opened. Must be towed by a truck. It can fire about 12 times a minute, and the barrel rests on shocks which keep it on target after firing. Aims between 0 and 90 degrees vertical. It has several kilometers of range. Costs 3 ore.
-B2 Destroyer: [L] [Expensive] A big, long piece of artillery with firing 100mm rounds. The barrel is nearly 3 meters long, for maximum muzzle velocity and accuracy. Its barrel sits on a hydro suspension mechanism, and lurches back each time the gun fires. It weighs more than a ton and can fire at great distance around 10 times a minute, when hand loaded in its locking screw breech. These rounds can be placed with pretty good consistency, for their range. Must be towed by a truck. Costs 4 ore.
-Bumblebee AT/AA: [L] A 3.6 inch gun. It can be aimed down close to the ground, or up the sky. It is aimed by a gunner who sits in a seat which inclines and declines with the gun itself, and has an iron sight which consists of two rings, the front of which has a "spiderweb" design. The gun is aimed with two traversal wheels. Fires fuzed flak rounds, which have an adjustable timer set by a dial on the gun itself. There is also a mechanical targeting calculator, which has a dial for target range, and rate of change of range, which can set the fuze time for shells accurately as the target moves. Additionally given an altitude and angle, the sight will automatically offset so that the gunner need merely keep the crosshair over the target. It is pretty effective, and also cheap and reliable. However, adjusting targeting calculator takes too long to aim at dive bombers and close, low-altitude planes. Fires about 15 times a minute. Costs 2 ore.
-AS-AC18: [L] An advanced primer ignition autocannon, which ignites cartridge primers before the round is fully chambered. It fires the 20x100mm round, fed from a top-mounted 25 round C-shaped magazine with a powerful spring, about 600 times per minute. The weapon is quite large with a simple action but heavy barrel, weighing over 40 kilograms, and it requires being mountedto fire with accuracy, although recoil is reduced by the nature of its action. It is dependent on a careful balance between the force of the shell and the force of the action, which means that different ammo types cannot be interchanged without recalibrating the gun, AP rounds are used most often. 3 Ore.
-Uniform AS-GU23: [L] The Forenian uniforms are based on the 1923 Arstotzkan ones, and come in patterned camouflage colors, grey/white, beige and olive. The uniform has parade dress colors on the inside, so can be worn inside-out at official funtions. Armor plates and helmet are lightweight Aluminum. Includes all the pockets and bandoliers a soldier could ask for, and one right on the elbow that nobody asked for. Costs 2 ore.
-AS-P32: [L] Parachute rigging. The parachute itself is large and round, and various straps, clips and buckles allow a soldier to carry a light primary weapon, their ammo and a grenade. Alternatively, a paratrooper could also bring a mortar or LMG and a few rounds, but only their sidearm with it. Radios need to be dropped separately. -Tiger Infantry Armor: [L] Infantry armor made of a forged manganese steel alloy. All of the armor plates are relatively thick for infantry, and the full suit weighs in at 36 pounds. The helmet is particularly thick, and fits round and close around the head, low over the eyes and down to the neck with a little outward slope. It can be attached with a face mask, which when worn allows a wide but very narrow viewing slit between the mask and helmet, while even covering the neck. The breastplate is curved outwards for optimal armor angle, with appearance of a ridge down the middle. The backplate is thick, but flat. At the waist these plates end and there are flat curved single-piece taces to protect the upper legs, below the knee the armor has no coverage. The pauldrons allow comfortable shoulder motion, being made of three layered plates, and the upper arms are covered by rerebraces, which are round fitted plates to the outside of the arm. While the lower arms, lower legs, and sometimes gaps around the shoulders are exposed, most parts of the armor will stop a pistol bullet at point blank. The breastplate and taces will stop rifle bullets at all but very close range. AP Horsekillers easily penetrate at medium range. The armor is tiring and cumbersome, troops cannot effectively crawl and kneeling is difficult, as is aiming down rifle sights while using the mask. Costs 3 ore.
-Model 3 Radio: [L] Vacuum tube radio, in two separate 30-pound boxes requiring two men to carry. It also includes a light, flexible antenna to attach to a tent pole or vehicle frame. It can fit into most vehicles without affecting performance. Transmits and receives audio. -Tiger's Whisper: [L] This radio device, instead of being used to transmit speech, issues and receives 26 discreet amplitudes on a given frequency. The amplitude broadcast is selected with a dial, and the amplitude received is is used to indicate a letter, using a fully circular meter which reads amplitude and is labeled with letters. When the dial, or meter, falls to zero after displaying a letter, it moves the paper indicator by an amount based on its highest position, like a rotary telephone dial. This means that the messages are bit more complex than a simple substitution. A communications officer must jot down each letter as he reads it. The letter indicators both on the dial and meter are pieces of card paper which can be changed, so that new substitutions can be issued to communications officers regularly in case a radio communicator falls into enemy hands. -AS-DC29: [L] An Arstotzkan device design to solve Moskurg's cipher. It is basically a Tiger's Whisper, with its own code card with the numbers 1 through 26. It uses a typewriter mechanism to stamp each number onto a ticker tape. The numbers on the ticker tape are the simple cipher version of the Moskurg message, which is relatively easy to solve by hand. In addition it includes a counter for each letter, displaying the frequency in which letters occur which helps solve ciphers faster. An average Arstotzkan officer is clever enough to use this to crack a Moskurg message in five to ten minutes. With a stolen code card, it can also act exactly as a Tiger's Whisper would, where communications officers must write down each letter as it appears. It is [Complex] and fits into a very heavy backpack. -The Death Ball: [L] [National Effort] [A 30-foot boulder, on two equally large steel wheels, which themselves are lined with rockets to propel it. The boulder is hewn smooth and round, and hollowed by stoneworkers (in 1935!) to support a stabilizing gyroscope. It can reliably roll in something resembling a straight line thanks to its gyroscope, although large moguls or divots will send it wildly off course. For the ten seconds or so it keeps to speed, it can crush a tank hull. In fact the most difficult thing about its use is moving it around before firing it. It, or the boulder from which it is constructed, is too large to move around on a truck, so it is instead dragged on a sled by several trucks, in a modern mechanized method which resembles the way in which ancient people moved stone megaliths. Once hewn into shape and given their gyro, chassis and rockets, they are generally not moved, but kept in place and rotated to aim. Costs 6 ore, 2 oil, and can only be deployed in areas with flat land access to a stone quarry. The Gyro system renders it [Complex]. -L-1 Tiger: [L] The Tiger is, despite its fierce name, a truck. It has a long, narrow nose in front of the cab containing a twelve cylinder engine, and the steering wheels are next to it under round cowls. It has a bed where a hopper, tanker, seats, trailer hitches or other things can easily be attached. There are six rear drive wheels, on independent suspension. Costs 3 ore, 2 oil. Provides +1 Transport Capacity. -AS-M17A: [L] A motorcycle which seats one passenger, and a second in a sidecar. The petrol motor is Arstotzka's first, with three in-line cylinders. On its own, the bike is capable of more than 80 kilometers per hour, cross country, and 110 on a road. The sidecar is available with a machine gun, sometimes on a pintle mount to aim at aircraft. 2 Ore, 1 Oil. -T2 Breaker: [L] A tank. It is medium armored throughout with RHA, with a slanted front but mostly square. The turret is specially cast as a rounded dome and rotates with electrical motors. Includes a 1.6 inch rifled Breaker cannon, with a long barrel, suspension and muzzle brake. The Breaker cannon can fire about 24 times a minute, it is single loaded by hand. It also has a coaxially mounted M3 Sorraia. The exit hatch is towards rear with another MG. The tank is a heavy, it sits on wide cowled treads and is powered by a big 12-cylinder diesel engine, and can get up to about 35 kph. Crewed by a driver, loader, gunner, and commander. Now with extra slat armor. Costs 5 Ore, 2 Oil. -AS-MAT26-50 [L]: A light tracked platform for the DT25 gun originally designed for the AS-T25 tank. Moves on a simply 8-cylinder motor and treads. It has thin RHA armor in the front only, with the rest open to the air. The DT-25 gun has an extended barrel with a muzzle brake, and is mounted on a front-facing armature with good side-to-side and vertical angling, for direct fire. It includes an M3 Sorraia for good measure against aircraft. Costs 4 ore, 2 oil. -AS-T33: [L] A tank similar to the AS-T25, with Heavy frontal armor, a radio as a standard feature. The shape is basically the same, a wedge with a cylindrical turret towards the back. It is powered by a turbocharged and fuel injected diesel engine, with twelve cylinders, which allows the tank to reach 45 kph. It is also armed with a new, enormous DT33 75mm cannon, which loads with a screw breech and can be fired about 12 times a minute, which happily penetrates medium armor at long range with HEAT rounds, and has similar accuracy but better range than the DT25. It includes one M3 Sorraia coaxially in the turret and one for a commander/spotter to use on a pintle. The turret is now operated by an electric motor on the horizontal traverse, and the tank has light spaced armor skirts around the turret, and on the sides down to the treads which help defend against HEAT rounds. A bit prone to running short on ammunition. Costs 6 ore, 3 oil. -SPAT: [L] A self-propelled gun vehicle consisting of a petrol engine, caterpillar tracks, and a forward-facing Bombardier howitzer with just enough armor plating to hide the crew behind. Rolls on treads with 4 driving wheels. They are prone to coming loose from the wheels from time to time. The armor is light, with a gap in the middle for the gun to rotate, raise and lower. Ammunition sits in racks behind the armor. The vehicle has a top speed of about 8 mph. The gun is just a Bombardier, fixed to the SPAT on a frame which pitches and yaws on a pair of hand cranks. The SPAT has a set of jacks to use when firing, which improve accuracy considerably by preventing the vehicle from shaking. Costs 3 ore, 2 oil. -Model 4 Yellowjacket: [L] A fighter aircraft, built fully of aluminium. It has flat low wings on a relatively long, narrow fuselage which holds its V12 motor. The motor is fuel injected, and cooled by a water radiator. It has six exhaust pipes poking out under the wing on each side, and a canopy-covered pilot seat close to the tail. It is relatively sturdy and maneuverable, it is fast and makes tight maneuvers but is "temperamental", prone to going into out-of-control rolls and requiring a tight grip on the joystick. The canopy includes a tubular gun sight. The six Sorraia guns in the wings provide ample firepower, but the six guns and their ammo are somewhat heavy. Moves faster and maneuvers better than the Wasp, as well as having a higher altitude ceiling. Costs 3 ore, 3 oil. -AS-DB-HF-23: [L] An airplane built entirely from aluminium. This lighter, sturdier frame allows the plane be reasonably fast with a 9-cylinder radial engine and make aggressive dives and recoveries for bombing, with half a ton of bombs. The radial engine is designed entirely around an AS-AC18 which fires through the prop shaft, necessitating a relatively heavy and thick prop shaft. It has decent maneuverability, with its metal design allowing for strong forces on the wings and tail, and large control surfaces, but it is best at dogfighting while not carrying a bomb load. Costs 4 ore, 3 oil. -AS-1931-HAFB: [L] A three-engine bomber with a shoulder wing. It is constructed of a geodetic aluminium frame with resin-treated fabric skin. The pilot sits in a cockpit on the front of the plane with a pyramidal canopy, and between the two wings is an AC18 gunner, on top of the plane, with a 360 degree rotation under a trapezoidal canopy. Has 3 turbocharged and injected engines, one in the nose and under each wing. Despite its size, this enables it to almost keep pace with AS-HF-24s and gives it a high altitude ceiling. These engines burn a lot of fuel, limiting range. It carries a two-ton payload of bombs, and a bomber with a sight which can be adjusted based on a written table for airspeed and altitude. At full altitude, these bombs are incapable of hitting precise targets, and especially moving targets. The plane also has fixed landing gear. Costs 5 ore, 4 oil. -AS-ARAC-35: [L] The ARAC is a mobile runway, carried by coal train on more than 30 consecutive train cars, which unfold their top armor into a runway long and wide enough for a HAFB to land, be drawn back by a winch and cable (as it cannot taxi), then take off after being refueled and rearmed. The runway panels are supported by jacks on either side and take about a day to setup or pack away. The process of landing and takeoff takes about forty minutes, limiting the amount of traffic that can use the runway. The train also requires a sufficiently flat and straight railway to be useful as a runway. This often constitutes making a special track, but is easier than building a runway. There is a good section of track in the central desert, east desert, and plains. There is currently no system to move aircraft from the runway to the ground and back. The runways can land a few planes and take them off in order, which park on the ends of the runway, but far less than a normal runway could store. Costs 10 ore.
-AS-CV22: [L] A steam-powered ship, worthy of sea travel. Uses two AS-51 S steam engines, which each power one screw. The vessel is around 60 meters long, and carries cargo enough to provide +1 Transport Capacity. It mounts an AC-18 on the bow for air defense, and an AS-1910 on top of the con tower. Costs 3 ore.
Before the war properly starts, you must choose which general (and therefore, which bonus) you will use, agree upon your final equipment list from the Moskurg and Arstotzkan equipment of the last war, and most of all you have one bonus design to use before the war starts- choose wisely! Also, you will need to agree upon a national flag. -AS-SP30: [L] General infantry sidearm. An Arstotzka-made semi-automatic pistol, firing 9mm. It has a 10-round magazine and can fire quickly with moderate accuracy, at short range. Moderate stopping power. It is pretty reliable, and has a threaded barrel and can be fitted with a suppressor. -AS-AR34: [L] The AR34 is an assault rifle chambered in new 7.62L ammunition, an intermediate powered cartridge. It is fed at the bottom from a wide 24-round magazine, or a 40-round drum, and ejects cartridges to the right side. It has a tactical rail an adjustable iron sights on top. It is select-fire, with a sliding knob for either single-shot or automatic. The knob is very stiff and requires soldiers to take their left hand off the weapon and force it. It has aluminum furniture, and a vertical pistol grip and foregrip. It weighs under 6kg. It has good stopping power and accuracy out to medium range, and is relatively easy for users to control even on automatic fire. It's about as long as the AS-F14, which means it is usable in close quarters but not ideal. Costs 2 ore (1 Al). -Sawed-off Shotgun: [L] General infantry sidearm. Fires twice before breech loading, very effective at short range, ineffective otherwise. Poor armor penetration. Uses 12 gauge shells. -M3 Sorraia GPMG: [L] A 7.62mm machine gun fed from a belt. 50-round belts can be strung together for extended fire or stored in a belt box attached to the Sorraia, which for practical purposes is similar to a magazine. It uses a recoil action, and is configured to fire around 800 rounds per minute, achieved with the help of a muzzle booster (which looks like a flared end on the barrel). Weighs 22 pounds. Comes with a bipod, or tripod for emplacements. It uses copper heat sinks, which are now shrouded. It has a changeable barrel, which is necessary for emplacement use. It is effective to about 800 yards when mounted. Costs 2 ore.
-AS-F14A: [L] A 7.62mm, semi-automatic rifle. It is an open bolt blowback action, and uses a 12-round box magazine with a small charge handle on the side. It has adjustable iron sights. The weight of the moving action makes the gun difficult to control, but this is mitigated by a heavy barrel. The blowback action is fairly reliable despite being open bolt. Also available as a carbine. -AS-AC18: An advanced primer ignition autocannon, which ignites cartridge primers before the round is fully chambered. It fires the new, large, 20x100mm round, fed from a top-mounted 25 round C-shaped magazine with a powerful spring, usually armor piercing, about 600 times per minute. The weapon is quite large with a simple action but heavy barrel, weighing over 40 kilograms, and it requires being mounted to a carriage, foundation, or vehicle to fire with accuracy, although recoil is reduced by the nature of its action. It is dependent on a careful balance between the force of the shell and the force of the action, which means that different ammo types cannot be interchanged without recalibrating the gun. It has a terrifying ability to punch through armor and emplacements. Costs 3 ore due to its size and the size of its ammo. -B2 Destroyer: [L] A big, long piece of artillery with firing 100mm rounds. The barrel is nearly 3 meters long, for maximum muzzle velocity and accuracy. Its barrel sits on a hydro suspension mechanism, and lurches back each time the gun fires. It weighs more than a ton and can fire at great distance around 10 times a minute, when hand loaded in its locking screw breech. These rounds can be placed with pretty good consistency, for their range. Must be towed by a truck. Costs 4 ore.
-Bumblebee AT/AA: [L] A 90mm gun. It can be aimed down close to the ground, or up at the sky. It is aimed by a gunner who sits in a seat which inclines and declines with the gun itself, and has an iron two-ringed "spiderweb" sight. The gun is aimed with two traversal wheels. Fires fuzed flak rounds, which have an adjustable timer set by a dial on the gun itself. There is also a mechanical targeting calculator, which has a dial for target range, and rate of change of range, which can set the fuze time for shells accurately as the target moves. Additionally given an altitude and angle, the sight will automatically offset so that the gunner need merely keep the crosshair over the target. It is pretty effective, and also cheap and reliable. However, adjusting targeting calculator takes too long to aim at dive bombers and close, low-altitude planes. Fires about 15 times a minute. Costs 2 ore.
-M1 Stallion: [L]This is a belt-fed machine gun using the enormous, thundering .60 caliber round. It is a cumbersome weapon, with a large box for the mechanism, and a narrow water-cooled barrel with copper heat sinks. The gun only fires about 180 times a minute. The gun hits in very tight groups for a machinegun, but it is heavy and can only be pivoted slowly, meaning only very skilled gunners can be accurate at long range. It can be moved on a cart, or by a team of four men who will also crew it when it is in place. Costs 2 ore.
General Tereshkova: The Forenian army is led by General Tereshkov, an expert pilot. With experience spanning back to the days of the terrifying AS-19 aircraft which pilots believed to be haunting, he trains Forenian pilots to quick witted and always on guard, and out-fly their enemies. -Uniform AS-GU40: [L] The Forenian uniforms are both intimidating and fashion-forward, rivaling the iconic Nazi German ones. They come with various camouflage colors on the outside, and parade colors on the inside so they can be turned inside-out. Warm weather uniforms are cotton and cold weather ones are wool, and all come with harnesses made of sturdy nylon straps, and all the pockets, pouches and bandoliers a soldier might need, plus one pocket on the elbow which nobody knows the purpose of, but it's there as a matter of tradition. It also comes with manganese-steel chest plate, back plate and helmet. But most of all, there's cool sunglasses. Costs 2 ore.
-The Death Ball: [L] [Very Expensive] [A 30-foot boulder, on two equally large steel wheels, which themselves are lined with rockets to propel it. The boulder is hewn smooth and round, and hollowed by stoneworkers (in 1935!) to support a stabilizing gyroscope. It can reliably roll in something resembling a straight line thanks to its gyroscope, although large moguls or divots will send it wildly off course. For the ten seconds or so it keeps to speed, it can crush a tank hull. In fact the most difficult thing about its use is moving it around before firing it. It, or the boulder from which it is constructed, is too large to move around on a truck, so it is instead dragged on a sled by several trucks, in a modern mechanized method which resembles the way in which ancient people moved stone megaliths. Once hewn into shape and given their gyro, chassis and rockets, they are generally not moved, but kept in place and rotated to aim. Costs 6 ore, 2 oil, and can only be deployed in areas with flat land access to a stone quarry. The Gyro system renders it [Complex]. -T2 Breaker: [L] [Expensive] A tank. It is medium armored throughout with RHA, with a slanted front but mostly square. The turret is specially cast as a rounded dome and rotates with electrical motors. Includes a 1.6 inch rifled Breaker cannon, with a long barrel, suspension and muzzle brake. The Breaker cannon can fire about 24 times a minute, it is single loaded by hand. It also has a coaxially mounted M3 Sorraia. The exit hatch is towards rear with another MG. The tank is a heavy, it sits on wide cowled treads and is powered by a big 12-cylinder diesel engine, and can get up to about 35 kph. Crewed by a driver, loader, gunner, and commander. Now with extra slat armor. Costs 5 Ore, 2 Oil. -AS-MAT26-50 [L]: A light tracked platform for the 50mm DT25 gun originally designed for the AS-T25 tank. Moves on a simply 8-cylinder motor and treads. It has thin RHA armor in the front only, with the rest open to the air. The DT-25 gun has an extended barrel with a muzzle brake, and is mounted on a front-facing armature with good side-to-side and vertical angling, for direct fire. It includes an M3 Sorraia for good measure against aircraft. Costs 4 ore, 2 oil. -AS-T33: [L] [Expensive] A tank similar to the AS-T25, with Heavy frontal armor, a radio as a standard feature. The shape is basically the same, a wedge with a cylindrical turret towards the back. It is powered by a turbocharged and fuel injected diesel engine, with twelve cylinders, which allows the tank to reach 45 kph. It is also armed with a new, enormous DT33 75mm cannon, which loads with a screw breech and can be fired about 12 times a minute, which happily penetrates medium armor at long range with HEAT rounds, and has similar accuracy but better range than the DT25. It includes one M3 Sorraia coaxially in the turret and one for a commander/spotter to use on a pintle. The turret is now operated by an electric motor on the horizontal traverse, and the tank has light spaced armor skirts around the turret, and on the sides down to the treads which help defend against HEAT rounds. A bit prone to running short on ammunition. Costs 6 ore, 3 oil. -SPAT: [L] A self-propelled gun vehicle consisting of a petrol engine, caterpillar tracks, and a forward-facing Bombardier howitzer with just enough armor plating to hide the crew behind. Rolls on treads with 4 driving wheels. They are prone to coming loose from the wheels from time to time. The armor is light, with a gap in the middle for the gun to rotate, raise and lower. Ammunition sits in racks behind the armor. The vehicle has a top speed of about 8 mph. The gun is just a 90mm Bombardier howitzer, fixed to the SPAT on a frame which pitches and yaws on a pair of hand cranks. The SPAT has a set of jacks to use when firing, which improve accuracy considerably by preventing the vehicle from shaking. Costs 3 ore, 2 oil. -AS-ARAC-35: [L] [Very Expensive] The ARAC is a mobile runway, carried by coal train on more than 30 consecutive train cars, which unfold their top armor into a runway long and wide enough for a HAFB to land, be drawn back by a winch and cable (as it cannot taxi), then take off after being refueled and rearmed. The runway panels are supported by jacks on either side and take about a day to setup or pack away. The process of landing and takeoff takes about forty minutes, limiting the amount of traffic that can use the runway. The train also requires a sufficiently flat and straight railway to be useful as a runway. This often constitutes making a special track, but is easier than building a runway. There is a good section of track in the central desert, east desert, and plains. There is currently no system to move aircraft from the runway to the ground and back. The runways can land a few planes and take them off in order, which park on the ends of the runway, but far less than a normal runway could store. Costs 10 ore.
Cutlasses: [L] Small, curved swords. 1911 Mano Derecha: [L] Single action, 5-round, .40 cal revolver. Heavy, with good stopping power. Issued with moon clips for speed loading. Reliable even when dirty or muddy, and available as a carbine variant. Thumper Hand Grenade:[L] An explosive thumper shell for hand throwing. Ignites on a three second fuze when a pin is pulled. Fragments of the ribbed case are lethal in a significant area. Type 51 Rockets (S1930E): [L] New rockets have a round ballistic cap with a flat warhead beneath, which has a normalizing effect on impacts- that is, the rocket flattens itself against surfaces before detonating so that hits don't have to be so square. It also includes more effective fins. The rocket is more accurate overall. Unfortunately, both of these new features are made from cardboard, and can be ruined if crushed or soaked. Kraken-C: [L] With the citadel armor mostly removed, and space used for housing soldiers and Nightwind ammunition as well as driving the turrets freed up, the Kraken can hold a significant amount of cargo. The Kraken-C grants 3 Transport Capacity. 1923 'Tombstone' 200 Pound Bomb: [L] This is a 200 pound, three foot long box of boom. Aerodynamic, with fins. (Note: To be merged into Barnacle description). M1935-SIHE 'Rum Barrel' 5lb Bomb:[L] The Rum Barrel is a light incendiary bomb intended to be dropped in great numbers. They have a magnesium body with an iron nose, and ignite with incendiary pellets on impact, which are intended to spread around after the bomb hits. General Cortez: General Cortez is a storied pirate sailor, and under him the Cannalan Navy has an inherent advantage in battle. Service Rifle Scope:[L] [Expensive] This is a refraction telescope, meant to be mounted on top of a rifle by screwing into the wooden stock. The objective lens is 1" in diameter, focusing light onto a smaller eyepiece for a 3.5x magnification. The eyepiece can be adjusted on the vertical and horizontal axes with a knob, to correct for range, windage, and imperfections in the scope mount. It has a short eye relief, meaning shooters must press their eye close to the scope, and keep a solid grip on their (very powerful) rifle to avoid getting a black eye from the scope. The lenses are complex to manufacture. Steel AP Rounds: [L]Hardened steel cannon shells improve the armor-piercing capability of a weapon. A weapon loaded with these costs 1 more ore than usual. HE Shells: Explosive fragmenting shells, for cannons. Tracer-Incendiary Rounds: [L]Bullets that emit a bright light, and might set things on fire. The capacity to cause fires diminishes at long range, and also depends on the size of the round. Available in rifle caliber and up. Bureacrat's Wife Radio Equipment: This is a portable radio system with a variety of new features. First, the entire system fits in a single backpack, with a battery good for about an hour and a hand crank charger (it can also charge off a truck). A two-way voice handset or morse transmitter can be attacked. It also has a "scrambler" which comes in a separate backpack-sized box- the vaccuum tubes necessary to make it work couldn't fit in the first. On this are three dials which set a "scramble pattern" and buttons for "wait" and "start". While in the "wait" state, the radio does not begin working until hearing a three-second "start tone" from another scrambler. Then both both begin switching frequencies multiple times per second in sync with each other, on an arbitrary pattern determined by the setting dials, making the voice or morse communication impossible to listen in on. The M1926 Short Rifle Cartridge is a brass cased, center fire rifle round using smokeless power measuring one-half inch by one-and-a-quarter inch, firing a quarter inch by three-quarter inch pointed, copper jacketed, boat tail projectile weighing five grams. The case is bottlenecked to fit the smaller projectile, and has a recessed rim for extraction. M1930 Uniforms: [L]The new, more modern uniforms are comfortable fitting with a wide variety of camoflauge. Officers have done away with exaggerated feathered hats in favor of standard helmets, and rank is indentified by comparatively subtle shoulder patches. Flak vests are available where appropriate. Parachutes and life jackets are available. Binoculars are issued where they are a priority, but remain expensive. Slat Armor: Slats of cheap, extra armor damage HEAT rounds to prevent them from penetrating. M1937 Gas Protection System:[L] Based loosely on oxygen masks used by pilots, this is mask which fully covers and seals around the face when properly tightened, and has built-in glass goggles. Instead of breathing from an oxygen take, users breathe outside air through a replaceable filter. The filter consists of a physical particulate filter and an activated charcoal layer. The masks contain asbestos, which top Cannalan doctors assure us is perfectly safe. There wasn't time to distribute special belts, coats and gloves with drawstrings to help seal out chemicals, so soldiers are simply instructed to tuck all their clothes into eachother and hold everything tight with belts, in order to protect their skin. APHE Shells (S1918E): [L] These are annealed steel armor-piercing shells, with a rear cavity containing explosives and a fuze. Upon impact, the fuze ignites the explosive, hopefully shattering the shell after it has penetrated the armor of the target. It's not quite as explodey as a plain HE shell, or armor-piercey as the pure steel AP shells. Air-burst rounds (S1929E): [L] HE shells which burst in air, to attack aircraft. Their timing is set by a device on the gun which fires them. Tereshkova I feel is the general which aligns best with our planned doctrine. For those who haven't been on discord, we plan to focus on air superiority and carriers, rather than a battleship navy. Bonuses in this field would be invaluable. 1: We erred when choosing the sub-machine gun. We misread the descriptions and chose the wrong one. We intended to pick the one with more flexible drum size. As such, could we change that to the MC16A? 2: I proposed a couple of flags in the old Arms Race thread. This one seemed the most popular. Kot also had some flag ideas, which he will no doubt post. Backstory: Following unification, the rapid acquisition of new military technology slowed almost to a halt. However, the new United Forenian Government did hire engineers to work on one area in which Forenia was lacking- the navy. They were tasked with ensuring that Forenia could defend her waters from foreign vessels, with the secondary goal of enabling Forenia to project force across the ocean, should the need arise. The new naval engineers went abroad to study foreign methods, and were somewhat surprised to learn that sailing ships were considered 'obsolete'. After catching up with a century's worth of naval engineering, they returned to Forenia to design a weapon capable of taking out ships threatening Forenia's shores. The possibility of designing a ship of their own was considered, but ultimately deemed 'boring'. They instead determined that air superiority could be translated into naval power- by means of an aerial torpedo. After designing the basic torpedo, designers will move on to extra features designed to increase the accuracy and stability of the weapon, so that it can be dropped at greater speeds, altitudes and ranges- making things safer for our bombers. Such features include: breakaway wooden stabilisers attached to the tail-fins, designed to improve aerodynamics, reduce airspeed, and break off on hitting the water; improved guidance system, using better gyroscopes and more precise fins. Detonator: Preferably magnetic, allowing the torpedo to hit ships from underneath. ESTIMATED DIFFICULTY: HARD Actually, probably Normal. The Cannalans rolled a one when designing their wet-heater torpedo, and got a dry-heater instead. And that was like a decade ago. It would be Easy, but for the modifications to make it aerial. 4: I agree that for our planned doctrine of air superiority, Tereshkova is the obvious choice. 5: Discord is, like, super easy to use. I really recommend joining it, for with which to join in on our top-secret strategy discussions. █████ Long Live United Forenia! Forenia has faced greater threats than Turbados before: itself. Tereshkova will be our general. Air superiority is crucial, especially for an ocean-based map that will rely on aircraft carriers. +1 for Tereshkova and Dolphin Torpedo. Air power rests at the apex of the first triad of victory, for it combines Mobility, Flexibility, and Initiative. So let's bomb them all to the afterlife! GENERATION 11: The first time you see this, copy it into your sig on any forum and add 1 to the generation. Social experiment. I presume you are still going through the equipment list to assign some costs, as I saw a few without at the time of posting? Looking at the three bonuses, it looks like we have 1 that boosts our air combat, 1 for ground combat, and 1 for general improvement. I think Tereshkova may be our best bet, as they have a massive naval advantage and planes would be the best counter to deal with them. In conjunction, the torpedo would be most effective at enforcing this doctrine. An addition to the design to list that it is made to be compatible with existing mountings may be warranted, though, to make sure we can deploy it immediately rather than needing to revise our planes. 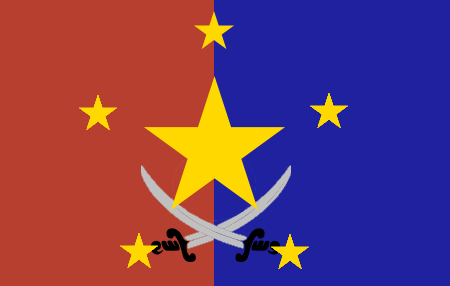 I favor this one as a result of the stars seeming to hold the swords, meaning those can easily represent the provinces of Arstotzka and Moskurg, or alternatively the provinces fought over for most of the war, the Mountains and the Jungles. Putting a space before and after the = screwed up the quote. High Priority Edit: Sensei, I followed the link to the discord in the OP, it seems the link got screwed up by including an apostrophe on either end of the url. Also, I support changing the description to specify compatibility with our existing bomber. Now with an avatar not years irrelevant! I was also going to suggest an aircraft carrier but when it was pointed out that our islands do all have airstrips I decided to agree with the Dolphin Torpedo as it is probably the more realistic initial measure. We can't stall for very long on building a navy, though, guys. We won't be able to rely purely on land-based airpower forever, especially once they start designing AA. Given the utter importance of our air power, I will vote for Tereshkova. I also like the Stars and Swords flag and will vote for it. Why do some pieces of equipment have two [L]'s? To clarify, I know [L] stands for "legacy", but some have "[L] [L]"